Printed from http://www.bodytalksystem.com//learn/news/article.cfm?id=944 on Apr 22, 2019. "She said I have to come to her for sessions of BodyTalk. She said her name is Homeira Franke"
My name is Laura Segal and I would like to share my story with you. In July 2014 my father was nagging me to have a mammogram. My gynaecologist had told me it was not necessary he would feel if there were any lumps and then he would send me for a mammogram. I eventually listened to my father and for peace went and had my first mammogram. When they said I must please stay and see the doctor I was confused. Anyway she came into the room with a needle and said there was a lump in my right breast and she needed to take a biopsy. I felt that someone had made a mistake and here was this needle going into my flesh. She inserted the needle three times. This was a Monday and I was told to come back the following Friday for the results. I told no-one because I could not believe what was happening. I went back on the Friday and was told it tested positive for cancer. Fortunately I had caught it early and had a good possibility of sorting it out. Going to your family and saying "I have cancer´ is a surreal experience. I still seemed not to accept this and when they looked at me with huge eyes with tears in them it was still a nightmare that I was going to wake up from. I then went to a surgeon to see what needed to be done. She said I had two choices – I could have a mastectomy or have the lump out. I figured it was a small lump and that I would have it out and that way would cause less stress to my body and psyche. She told me if I choose that course I would have to have 6 weeks of radiation and a course of medication after that. Didn't sound so bad so I booked myself into Olivedale Clinic. The first time I went they took out glands to test for cancer. These came back negative. So I then went to the Breast Clinic and they put wires in my breast so that the surgeon would know how deep to operate and that she could remove the lump. I then went back to Olivedale and after numerous xrays for soft tissue – bones etc etc they operated and took the lump out. I then had to wait for the tests to come back and after a few days when I went to have the drain removed the doctor informed me that it had all been removed. Tears of joy. I then had to start radiation. The ladies that do the radiation are all angels. I had a bad reaction in that I was exhausted – I had pains in my bones – my breast was burnt and sore. I looked like a walking corpse. I was going to work in the mornings and in the afternoons I was having radiation. I really was having a very bad time. I live on my own and had to see to my animals and myself all through this. I then met a lady through someone who had gone through the same thing and was not happy with my rate of recovery. This lady came bouncing into my office one day and told me Phil had sent her to help me. I was not sure what she meant. She said I have to come to her for sessions of BODY TALK. 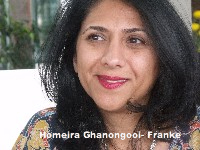 She said her name is Homeira Franke. I had absolutely no idea what she was talking about. However I was desperate and would have tried anything to feel better. I had two sessions, after which I was controlling the terrible hot flushes that were occurring about 12 times a day and all night. Homeira had given me exercises that I could do to help and I did not have to go to a doctor or take tablets. After those sessions all I needed was follow up once a month. I got my energy back due to the fact that I could now sleep without having to dry myself all night. I am so grateful to Homeira for her help. She got me back to a human state. I will always remember her for her concern and kindness.